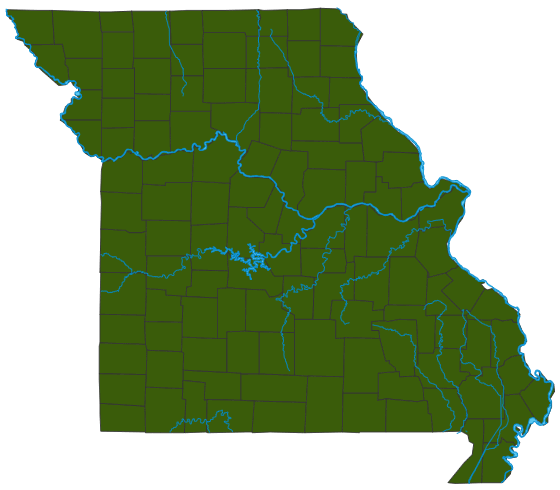 There are many species of sweat bees in several genera in Missouri. All are small; none are aggressive. They can be brightly colored or dark; they can be metallic; their markings vary from green to red to yellow, often with bands similar to those of honeybees. To humans, one of the most noticeable traits of sweat bees is their attraction to perspiration, which offers them precious moisture and salts. Length: 1/4 to 3/4 inch. Many sweat bees are quite small. The many species in this group occupy a great variety of habitats. Nearly all sweat bees nest in the ground; a few nest in rotten wood. The bright green bees in the genus Augochlorella are the smallest and most abundant sweat bees, and many in that group have developed social behavior. However, their soil nests rarely have more than a few occupants. Larvae, developing within the underground nests, eat from a mass of pollen and nectar that was provided to them when their eggs were laid. Adults, like many other bees, eat nectar and pollen, pollinating flowers in the process. Like deer visiting a salt lick, or an athlete drinking an electrolyte beverage, they supplement their diet with salts, which they sometimes try to obtain from sweating humans. Some are solitary, but a number show different levels of social behavior. Sweat bees that begin a nest in April are frequently joined by other overwintered females that have not started nests. In these joint nests some individuals may function as workers and not lay eggs. By summer only one egg-laying bee remains. Some of her female offspring are workers, while others mate and survive the winter to start nests the following spring. Sweat bees are famous—or infamous—for their tendency to land on humans to obtain moisture and salts from perspiration. A gentle scrape will usually persuade a visiting sweat bee to move on, but pressing on a female sweat bee may prompt her to respond with a mild sting. An intriguing behavior that evolved in many insects is kleptoparasitism (klepto- means "stealing"). Some types of sweat bees sneak into the nests of other species, eat the egg of the "rightful owner" and lay their own egg on the food provided. Kleptoparasites thus depend on their hosts for life.